This is a delicious collection of easy-to-follow dessert and pudding recipes from one of the best-known cookery writers in the UK, Mary Berry. There is nothing more tantalizing than a fruit tart in the summer, a decadent chocolate gateau in the winter, and a good sticky toffee pudding any time you like. 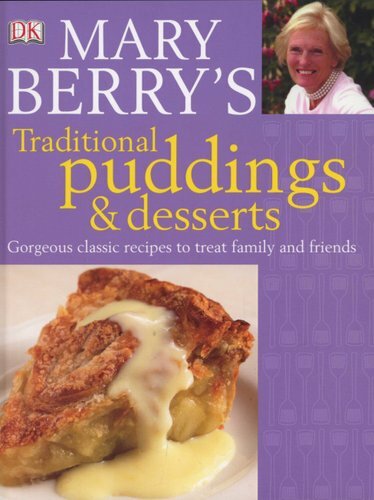 Using her expertise of traditional family cooking, Mary Berry shows how to make over 160 puddings and desserts, from old favourites, to variations on classic recipes and new mouth-watering ideas.Choose from a variety of pies, tarts, cakes, meringues, sorbets and ice creams. There is a visual recipe chooser that makes it easy for you to select a dish to suit your mood. Tips and techniques, such as how to make a pastry and decorate with chocolate, will help you hone your skills to perfection. Plus, preparation tips enable you to save time in the kitchen. This title is essential for anyone who likes their meals to end with a real treat! 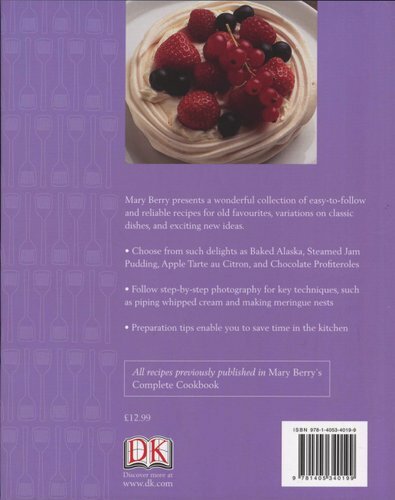 It includes all recipes previously published in Mary Berry's "Complete Cookbook".